Love. Hate. Tragedy. Success. Inspiration. Nelson Mandela’s A Long Walk to Freedom, showcases everything that there is to despise about the human race, and everything that there is to admire about humanity. Likewise, Invictus speaks to our determination and our inherent nature to strive for good. People, I believe, are both good and bad – inside of us, they both live … and they both battle … day in and day out, and eventually, one of them wins. 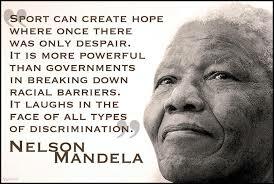 I can only hope that for me, as for you, that like Mr. Mandela, that the good wins in the end. Previous The talking of the soul with itself. Next Whatever happened to Lois Lane? You quoted Nelson Mandela! I like him. He’s very inspirational. Also, I agree with you. I like to think positive. I’m glad I found your blog through the daily prompt. Feel free to comment and check out my blog as well. Keep writing!